Perfectly timed with the new season of Doctor Who, I read this new novel featuring the Fourth Doctor as played by Tom Baker. Having never seen any of the original episodes I'm always curious to read about new Doctors, especially since the Fourth Doctor might be the most famous of all. It 1978, Scotland, and something weird is going on in the Fetch Brothers’ Golf Spa Hotel where golfers are being dragged down bunkers never to be seen again. The Doctor and his new found companions Bryony and Putta think it might have something to do with the somewhat peculiar owner of the Fetch Brothers’ Golf Spa Hotel, Mrs. Fetch and her twin grandchildren. But exactly what is going on? As Doctor Who novels go, this was one of the weirdest I've read. I'll admit that I'm in no way an expert on Doctor Who, but I enjoy watching the show and reading the stories. And I think this is a novel best suited for people like me, who have had at least some earlier introduction to the series. I wouldn't recommend it for people who are unfamiliar with Doctor Who and who would like to change that. 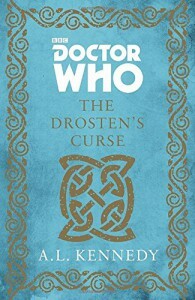 It didn't read like a beginners book, as the Doctor in this novel is quite eccentric and it might take some getting used to it to fully appreciate it. This being said, a lot was going on all the time, though it still missed the speed and swiftness of an episode of the show. I believe this novel was a bit longer than I'm used to when reading Doctor Who novels, so it might have to do a bit with the length. I liked the fact that Bryony and Putta were special companions, as they were only introduced at the beginning of the story and I didn't feel like I'd missed tons of backstory. They were also great companions as such, giving the story something extra. And while the writing was really good, I was not such a big fan of the story. I can't put my finger on exactly what it was that wasn't working for me, but I never really felt it and didn't think it was that special. Nevertheless it was an enjoyable Doctor Who novel and I'm glad I read it, if only to add the Fourth Doctor to the list. Thanks to Blogging For Books for providing me with a copy of this book in exchange for an honest review!